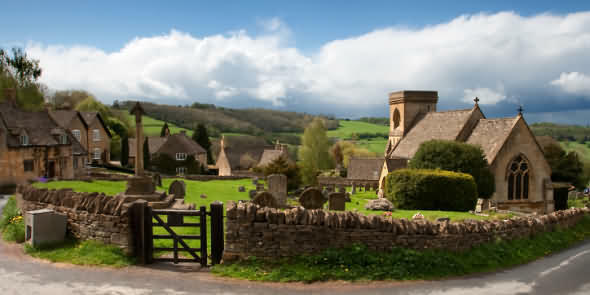 Snowshill village sits on the top of the escarpment above the villages of Broadway, Buckland, and Laverton. It is a secluded village where ancient pretty cottages and a 19th century church cluster around a small green. As its name implies - if there is any snow about then you will find it here first. Snowshill is renowned for its manor house, now administered by the National Trust. It is interesting architecturally as a typical 15th to 16th Century manor house, with a good dovecote. The beautiful gardens are terraced and were designed by Charles Wade. On the site is a teashop and restaurant. Here in Snowshill you will find ancient charm and peaceful ambling with refreshments to be had at the Snowshill Arms pub. Snowshill Manor is a fascinating tudor mansion. The house was purchased in 1919 by Charles Padget Wade, an eccentric architect and antiquary. The manor was restored as a setting for Wade's huge collection of craftsmanship, as well as models which he had created. It is thought that Wade never lived in the manor house choosing a spartan lifestyle in the old priest's house in the courtyard (small building on left in picture). Wade was born in 1883, the son of a sugar plantation owner. He was to inherit the plantations on St Kitts in 1911, which enabled him later to buy Snowshill Manor. Wade was and remains an enigmatic character. 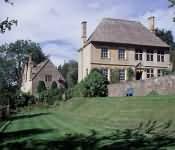 Several notable figures of the twentieth century met him and stayed at the Manor - John Betjeman, Graham Greene, Virginia Woolf, John Buchan and J B Priestley among them - and give differing impressions of their meetings. There is little doubt that Wade cultivated this elusive persona; he dressed very theatrically, almost ghoulishly, and the collection is itself like a performance, a theatre of objects. Snowshill Manor was owned by Winchcombe Abbey as early as 821, until the Dissolution of the Monasteries in 1539. It was at one point part of Katherine Parr's marriage dowry, although she probably never visited. The house passed through many different hands and the way it has been added on to at different points in its history reflects this. The northern end of the house is the oldest surviving part, dating from around 1500, still medieval in its design. It was extended and reshaped in around 1600 but it was the additions by the Sambach family in the early part of the eighteenth century that from one viewpoint radically altered the aspect of the manor from an Elizabethan to a Georgian house. The garden at Snowshill Manor was designed by M.H. Baillie Scott - a leading figure in the Arts and Crafts Movement. Read more about - Charles Padget Wade. Snowshill Manor, its gardens and exhibits. The Winter scenes of the film 'Bridgette Jones's Diaries' were filmed here. Walking in the magnificent countryside. DRIVING DISTANCES - Broadway 5 minutes, Chipping Campden 20 minutes, Winchcombe 20 minutes, Stow 15 minutes, Moreton in Marsh 15 minutes.